For proper adherence, all surfaces should be considered as dirty and should therefore be cleaned prior to any vinyl application. Household surface cleaners, such as Windex, are acceptable; however, we recommend a 2-to-1 mixture of water and isopropyl alcohol. After thorough washing, wipe the surface dry with a clean, dry, lint-free cloth.Air and surface temperature must be above 55 degrees Fahrenheit for the application of the vinyl. pencil. Water soluble pencils are available on our accessory pages. Precision marking will help assure a level application. Once you have the overall area defined and marked, you should have a good idea as to where the upper right and left corners of the decal should be placed. At this time, take your decal (paper and all) and tape the right upper corner of it to your predetermined area. Have your assistant hold the upper left corner of the decal in place while you stand back a few feet and look at it. If you like it’s placement, move on to step 2. 2. Tape the left corner in place and put a piece of tape down the center of the decal. At this time, using your water-soluble pencil, place a mark on the right and left side of the decal. Make sure you mark both the tape and the surface you are mounting the decal to. You will be aligning these two marks later, so be sure you can see them clearly. 3. On the Left side of the decal, hold the paper and peel off the tape until you reach the center of the decal. 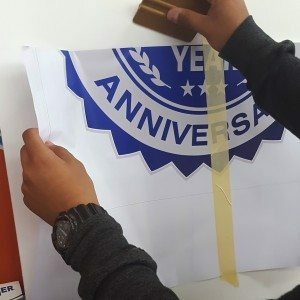 (The decal should stay stuck to the application tape at this time) Cut the paper as close to the center as you can, without scratching your surface. 4. Spray the surface on the left side with water or application fluid (we recommend the application fluid) Note: do not spray water or application fluid when using reflective vinyl. Reflective vinyl should be applied on a dry surface. Place the left side of the decal down on the surface, taking care to line up the lines you drew in step 2. 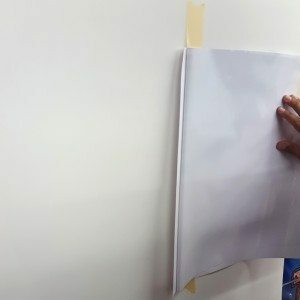 With the application tape still intact, squeegee the decal to the surface by applying pressure with smooth even strokes. Start at the middle of the decal and work your way out to the left. Note: Before you squeegee, make sure there are no wrinkles in the decal or application tape. 5. Lift up the right hand side of the decal and remove the remainder of the backing paper. (It is ok to lift up the piece of center tape at this time). Apply application fluid to the right hand surface. Place the right hand decal taking care to align your marks on the right hand side. Again, start at the middle and squeegee toward the right hand side of the decal. Note: Before you squeegee make sure there are no wrinkles in the decal or application tape. It is a good Idea to wait just a couple of minutes before you remove the application tape. 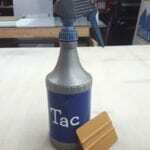 This allows the application fluid to begin drying and will prevent the decal from trying to come up. 6. Once it is adhered to the surface, squeegee the entire decal a second time. 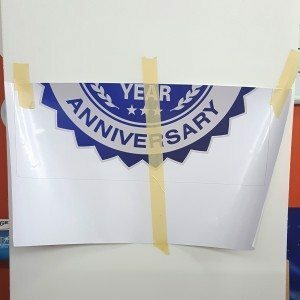 Then carefully peel the tape off the entire decal. It is common for there to be some small bubbles throughout the decal. These bubbles will leave by themselves within a few weeks. If you have any major, bubbles you can eliminate them by carefully heating the area with a hair dryer or heat gun, then puncturing them with a needle and applying pressure with your thumb. Note: You can do more damage than good by chasing the smaller bubbles. They will leave themselves as the vinyl breathes and the application fluid evaporates.